It’s a long Labor Day Weekend here in the USA and retailers hope you’ll spend at least part of your time off shopping. In this post you’ll find plenty of promotional discounts and lots of pretty clothing, shoes and accessories too. Amazon | Amazon is having some incredible shoe deals right now, clearing out stock at up to 70% off. | Picks: I rounded up picks from two of my favorite brands in this sponsored post; you can go through all the best shoes deals here, and see shoes from 25% off and up here. 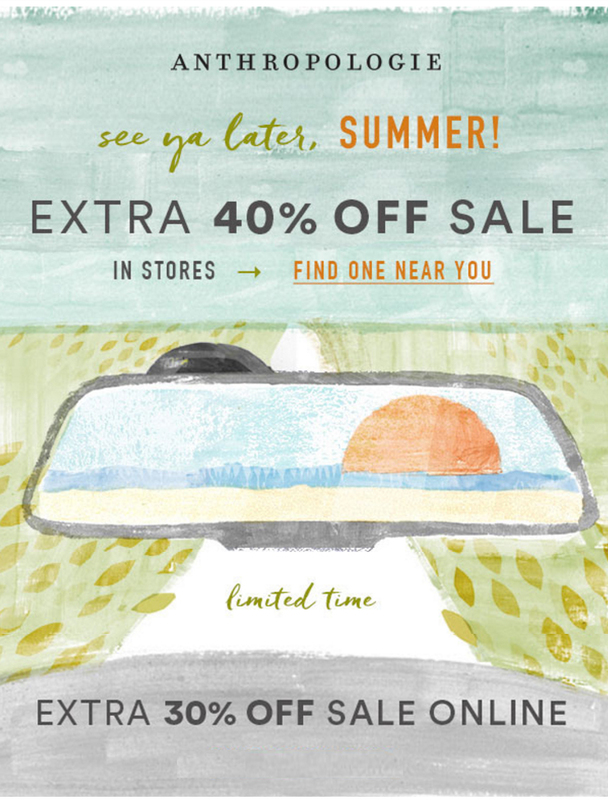 Anthropologie | Take an extra 40% off sale online. In stores too. No code required; discount reflects at checkout. | Picks: See this post. Glad to see Anthro extended the extra 40% off to their website too! Boden | Take 20% off your order with the code 6J4P. | Picks: Plenty! See this recent outfit ideas post and this eye candy post. Club Monaco | It’s a tiered promo! Take 20% off your $200+ purchase, 25% off $300+ and 30% off $400+. Use the code FALL17. | Picks: Let the Jowdie Dress ($249) be your guide; thinking ahead to colder days the Perrinney Cashmere Sweater ($289), Simisola Cashmere Sweater ($260) and Sidone Bow Cashmere Sweater ($329) are all must-haves. Free People | Take an extra 25% off sale, in stores and online. No code required. | Picks: Check out this recent post. Club Monaco is offering a tiered discount over the weekend. Details above. J. Crew | Take 30% off your purchase using the code YESPLEASE. | Picks: Pretty dresses galore, from the work or date-ready Tiered eyelet dress (now $88) to the comfy casual Chambray shirtdress ($70) or the elegant Long drapey spaghetti-strap dress in stripe ($168) — wear a cute jacket over it for contrast. LOFT | Take 30% off full price items. | Picks: LOFT has some extra cute tops right now, like this beautiful blue blouse, this cute drapey blouse, and this more trendy sheer blouse and this velvet-trimmed off-the-shoulder blouse. Nordstrom Rack | Take an additional 25% off clearance. | Picks: The Rack is a great place to score designer names at a discount. I love these Vince pumps, these destructed Rag & Bone jeans, this flowy Vince Camuto maxi and this super cute Frye messenger bag. Rebecca Taylor | Take an extra 40% off sale with code SUNSET. | Picks: Don’t mind if I do! It’s a near overload of pretty that leads to delights like the Moonlight Garden Dress ($360 before the discount), my Washed Leather Jacket (now $800 before discount, on me here), the similar but more feminine in the shoulders Garment Washed Leather Moto Jacket ($849 pre-discount), the Tumbled Leather Skirt ($290 pre-discount and now final sale) and the Yarn-Died Striped Dress ($150 before discount, final sale). What other promotions should the community know about this weekend? Hope it’s fun and relaxing for everyone!!! Previous Post The Amazing Shoe Steals on Amazon Fashion Right Now! That Anthro promo difference is so annoying. Not everyone lives close to a store or has the luxury of time to stop in. Just a ploy to drive foot traffic. They should be trying to do that with stellar merchandise instead. I got an email from Anthro this morning that says 40% both online and in stores. I guess they changed their mind about limiting the 40% to stores only. Oh good! I know Free People does this — the first day of the extra % off sale is app only, the second day is in-store only, and then it becomes available to everyone online and in-stores. It's nauseating as a customer. I'll update the post now! Regarding promos: can anyone who worked in Anthro stores tell me what happens to online items, including shoes, that are returned in store? Are they returned to the warehouse if the store manager decides not to put them out on the sales floor? It seems to me that SAs have first dibs… I have witnessed them claiming an item that was returned, which is a justified perk of their underpaid job. I don't know much more than that. I have seen at least a couple of them wearing stuff I returned, especially the cheapest stuff I didn't keep because I have way too much already. I think Anthropologie is trying to avoid stores sending back items to the warehouse at all costs now. There is a pair of shoes that one of the NYC stores uses for display; the shoes are from about 3 years ago and it's a pair I really wanted but sadly they are not my size. I always get a false rush of excitement when I see them out until I remember they're not my size, waaaaaaa. The problem is stores often toss returns into backstock and forget about them. So as a customer you sometimes have to really push them to check back there "Can you please check backstock? Your inventory shows you have this, perhaps it got tossed in the wrong pile? I used to be much more determined about things like this, but these days I mostly can't be bothered. Hi- Former PS here, returned online items are put on the floor. Online only items should go in to the found and collected section and shoes are marked down 15% and should be in the sale room. Beholden dresses should be sent back to the warehouse but sometimes end up in the found and collection area. If inventory shows only 1 item, there is a good chance the store doesn't have it. 1 more often than not means 0. Petite items are handled differently in each store. At my request, our store would put them in the found and collected area but some stores send them back to the warehouse. It just depends on the floor space available. Sometimes the SA that processed the return will purchase the item. Hope that helps. Thank you so much for clearing that up! It also explains why I've only seen petite online items in some stores and not others. I suppose with more new Fall items out, more ends up in backstock, but I sure wish the 'found and collected' had priority as it has saved me from placing orders for items that don't work for me, and vice versa. I suspect lack of space is also why so many stores discard shoe boxes, but seeing almost $400 shoes tossed in a bin with others makes them feel very cheap. I saw the same with delicate silk bras that cost $180 whose lace ripped by being caught on other hooks. Thank you anon, very helpful!! They mark down full price shoes that are returned in store? Now I know why I once saw a full price pair of shoes I returned turn up in the sale section while they were still full price. All of my local stores put them out to sell. Just checked Anthro web site new arrivals and I finally like some items. For example Donna embroidered cardi and Levi's Sherpa trucker jacket. Velvet puffer coat looks adorable though it's too pricey for me and not very practical. Agreed! I also tried on two dresses there yesterday and actually LIKED them both!! I'll have a new arrivals post up next week to discuss. I'd love to see some reviews from you! I'll see what I can do. The post is already written, and NYFW is next week which is one of the busiest weeks of my year. No promises but you are heard and noted!! Oh, I love it when you do dressing room reviews! I miss those reviews like crazy hehe! I just bought a couple of cute flats at the store because I don't really have a lot of those in my closet and I have to say the shoe department was looking pretty good! I also recently bought Hei Hei's Velvet Quilt jacket and it's really super cute and TTS. I also ordered the Hei Hei Velvet Quilt Jacket but was surprised how shiny the velvet is. Looks more metallic than velvet. It fit well and I like everything except the shine. Does yours look super shiny or more like a velvet? Hi Jess – I think I know what the problem is. The nap on the jacket is running the wrong way. If I turn the jacket upside down, it looks like what I was expecting. If I turn it right side up, it is almost blinding! I ordered two sizes in petite and both are cut the same way. I wonder if the regular sizes are the same. Does the nap on yours look like this, nice one way, super shiny the other? Thanks for the info Jess! Maybe it is the way the light hits it where I am trying it on, but sometimes it looks more like a chrome plated jacket than a velvet jacket! I am going to see if I can find one in a store to compare. I do like it, but maybe not quite so shiny . . . .
Hey Jess, I see today there is a review of the jacket, complaining about "the sheen of the fabric." So I guess I have to decide if the many pluses of the jacket outweigh the one (for me at least) minus. Just wanted to share with you all. Hurricane Harvey is gone. Only threat left is overflowing dams and rivers. that's super scary as they are releasing water to prevent them from breaking (dams). so more people homes are flooding. We (me including lots of my friends I know) feel blessed. I have donated lots of items (clothing, towels, blankets etc) and will be volunteering soon depending upon my work schedule. Thanks a lot all of you for your love and prayers. Love u all too. I have been watching (and then making myself stop watching) videos of the heroic rescues happening in and around Houston. I'm so glad you are safe Nam and mostly unaffected, and I wish the same for all of our community members in the area. Yes Roxy!!! Police military coastal guards are amazing. Even people in Houston are helping neighbors or people with boats. Amazing people here. Thank you so much for the update Nam, so glad to hear you're safe! I've been glued to the news and I'm heartbroken for so many people and also very touched by how many have gone above and beyond to help out others in need. Prayers to all who are affected in Texas. I just received this dress today and it is definitely a keeper!!! That hasn't happened in a while for me…..it is exquisite and fits tts……Nam, I hope you are doing ok and can't imagine all you have gone through. Glad to hear that you are still safe, Nam. What's happening there is so heartbreaking. I've also been reading about the catastrophic monsoons in India. I hope that all of your family there are ok too. OT: Does anyone understand how Anthro process our orders? Lately, all of my orders weren't processed until 4 days later after I placed the orders. The status shows: " Order received" during those 4 days, then it changed to " has yet to ship". My question is why it takes them so long to be processed? Does anyone have the same problem? Yes, same for my last orders. And they take weeks to arrive. But, hey, free shipping. I wonder if Anthro now gets such a high volume of online orders since store stock is so limited? then as " backorder until aug 31" ( which was the same date so doesn't make any sense). What's the deal anthro? I'll be completely annoyed if I get a cancellation when there were so many in stock at the time I placed the order. You know what Stephanie, i did get a cancellation😖. I went online and checked the item inventory, it shows a lot still available. I tried again and the item was shipped out today. The problem is anthro day has passed, means i lost the discount on the item. Very annoying. Call Customer Service, explain what happened and ask them to honor the Anthro Day discount for the new order. I think they will. I always ask for an adjustment under this scenario, and they have always granted the request. Definitely call customer service on this one. I don't know the exact intricacies or if this is accurate, but a store manager that I know (not in NYC) told me that to save on shipping fees Anthropologie is know trying to fulfill online orders locally first — so from a store — and then if they cannot from the warehouse. My guess is they are experimenting with this in a few cities but not everywhere. So that is why your order may sit for several days as it is being bounced from store to store. Or, another and more simple explanation is that the warehouses often have their smallest staffs in the summer, and it's possible they're backed up. Oh and my local store had even better stuff to choose from than the website has, including things that show as sold out online. The shipping is free, but the sale items are all final sale so I'm happy I got to try it all on before buying. Actually their size chart says the size large is a size 12, so I would say this would fit size 12 to 16 since it's loose but has a tie that can be tied in the back to cinch it. One last thing, you can call to find out if they have other sizes, colors & styles in stock for the sale. The store ordered me something that was out of stock in store.